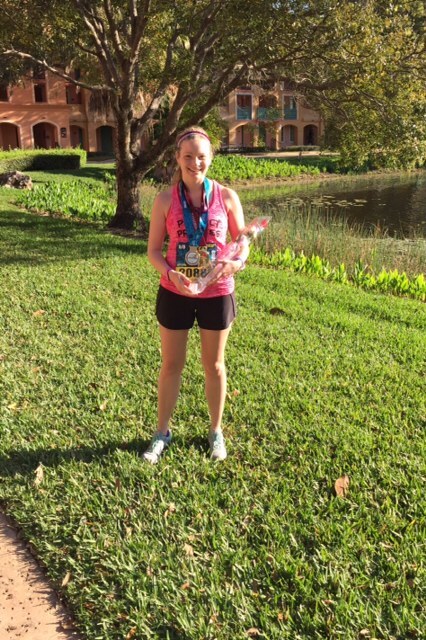 So this is now my fourth post about this year's Disney Princess Half Marathon, and it's going to be the last (at least recapping the weekend). I wish it could go on forever, but alas, all magical things must come to an end according to Fairy Godmother. So here we go - the half marathon, the final race between me and completing Glass Slipper Challenge number 4 (and coincidentally, the final Glass Slipper Challenge because next year it's going to change to the the Fairy Tale Challenge). What's even crazier to think about is that, as I'm posting this, I'm already registered for Princess 2018 thanks to past participant early registration! I know, crazy right?! Crazy amazing! Anyway, back to 2017. This was my third early morning in a row because this year I tacked on the 5k. That's probably the hardest part of these Disney races. I got my peanut butter bagel together and, a little bleary-eyed, we made our way to the buses (in case you haven't done Disney races before, they do allow spectators to ride the bus). After a short ride, we were back at the same spot - the Epcot parking lot one more time - and I just couldn't believe all the people. I've done this so many years and am constantly amazed by the masses and masses of people, which you have to factor into your logistical timing. The starting area for the half marathon is in a different place than the 5k and 10k. Once the buses drop you off, you have a good 20 minute walk even after you clear security and make your way to the entertainment area. I made the mistake of waiting there too long one year and ended up running into my corral just in time. No one needs that pressure, so I just went there directly this time. Hard to tell because it's so dark, but this is the view back at the corrals. Then once you get to the corral area, there are corrals for days! They go down the street and then wrap back around so that you basically have two rows of corrals. Not complaining at all about my placement for this one, but it was probably another near 10 minute walk up toward the start to get situated. Apparently there was a lot of traffic getting in and a lot of people running late, so they delayed the start of the race. Even though I was ready to get rolling, I appreciate runDisney trying to ensure that everyone has a good experience. Then, it was finally time to get started. They announced the beginning of the corral, we started moving, and then we were stopped. I thought it was a glitch, but I've heard others say that they staggered the corrals (like they did for the 5k and 10k) to help with the congestion. The delay wasn't long though, and then we were off! Once again, I didn't take a lot (okay, any) pictures along the way or stop for characters. Even beginning in the early corrals, the lines are long to get these photo ops! Some day I may have to try it .... maybe. We traveled from Epcot up to the Magic Kingdom (my favorite part). There's just something really special about coming in and running up Main Street, then winding your way through the park. It was so well timed having several Beauty and the Beast characters right before you ran through the castle. That's maybe the best photo op of the race - either that or with Spaceship Earth in the background. When you leave Magic Kingdom, you begin the long trek back to Epcot. By this time, the sun was out and I was so glad I brought along my sunglasses! I even met a fellow Perfect Princess along the way! It was a beautiful day - great day for a run. I didn't have any kind of spectacular time, but I trucked along, enjoyed the scenery and just BEING in Disney, and had some fun conversations along the way with other runners. We talked about running, Disney, and all of the recent runDisney changes. And then before I knew it, it was over! I collected my medals and my snacks and headed back towards the bus to get a much needed shower and a nap! I have to admit that I'm still not happy with this half marathon medal. I realize that runDisney has been changing a lot of things, including medal designs. I get that. I just don't like this one. It feels plain and has a distinct lack of princess sparkle. But all in all, it was a good haul! Run This Race If: You love Disney, Princesses, dressing up to race and/or are looking for a magical and entertaining half marathon. Course: Loop course (for the most part), on mostly paved roads with a few different surface materials when you get into the parks. What Makes It Unique: It's Disney. And Princesses. Did I mention the Disney Princesses? Would I do It Again: Already registered! This Perfect Princesses is keeping her hands on that crown! Believe it or not, this was my first runDisney 5k. Somehow it seems very appropriate that it was the Princess Half Marathon weekend. In case you're wondering why I have never jumped on the bandwagon before, I have to tell you that it's because up until last Fall, Disney gave our rubber "medallions" for 5k finishers. When they converted to metal medals ... well I just had to jump onbaord! The morning started just like any other runDisney race - EARLY! Okay so this one was half an hour later than the rest, but when you have to board the bus by 4:30, it still feels pretty early. We unloaded off the buses outside Epcot and began the trudge to the start area. And I do say start area because its not just corrals. For the record, this is the exact same setup as the 10k, too. When you get there so early, there's some time to kill, so there was a stage, music, etc. It's so great for people watching and costume spotting. I'm not clever enough to come up with great costumes, but I so appreciate seeing everyone else's! The weather was pretty warm and humid; definitely not complaining though and made it much more pleasant for spectators. I was placed into the A corral, which meant we did this little walk down and around all the rest of the corrals. Won't lie, it made me feel like a big deal. To be clear, this race was not timed, it was a fun run, but they still had corrals anyway to try and contain the madness that is thousands upon thousands of princesses all moving in the same direction. So here I was, ready to go. The announcers seemed to be announcing the start of the corral, fireworks went off, we moved a little bit and then stopped. I learned this later, but apparently they were also breaking the corrals up into sub groups to try to minimize congestion. Without much delay we were off, winding our way through the parking lot on our way to Epcot. Sorry I didn't take pictures along the way, but we wound around the World Showcase, did a little jaunt around the rest of Epcot and finished back in the parking lot. It was a little wild to finish before the sun was even up, but what was even crazier was that I didn't know how much they were spacing out the start. I collected my medal and snacks, stretched, and walked back over to where the bus was going to take us back to the resort ..... and then we waited for probably another 30 minutes. The whole start area had to clear before the buses could come in to pick us up. Run This Race If: You don't mind a 5k with some extra logistical challenges (and magic) that is not timed. Good for locals or anyone traveling in for the other races. Course: Loop course (mostly), on mostly paved roads in parking lots, roads, and through the park. Almost entirely pancake flat. What Makes It Unique: Well it's Disney and super low pressure. I also like that you get a cotton shirt instead of a tech shirt. You get to see Epcot in all its splendor lit up with multiple characters along the way for entertainment. They also pump up the Disney tunes pretty loud in Epcot, so you might not even need to bring music to this one! Cost: Pricey, $80 for the 5k alone. Date and Time: Race starts at 5:30 AM on the Friday of Princess Marathon Weekend. Would I do It Again: Definitely planning to sign up for next year. I'm back from my favorite weekend of the whole year - Disney's Princess Half Marathon weekend. I cannot believe it's over; it was amazing and wonderful and magical and I wish I could have slowed it down just a little bit. Because there is so much to unpack about this weekend, I'm going to break this post up into a number of smaller posts to keep things manageable. Let's start with the expo! We arrived on Thursday, which is a day earlier than I've ever gone before, because this year I was running the 5k. That also means I got to go to the expo a day earlier than usual! We dropped our bags at the hotel and boarded a bus headed straight for ESPN Wide World of Sports. The stories have been rampant about how insane the expo is on the first day. While I would say that's true, I feel like it's also pretty insane on the rest of the days. My main priority was getting my packet - Glass Slipper Challenge and 5k runner packet pickup was in one building, and Half Marathon and 10k packet pickup was in another, larger building. I got my bibs and shirts - volunteers at both stations cheered for me when they realized I am a perfect princess (totally made my day). Then we headed to the official merchandise areas, where I found a few things I just couldn't live without. For a number of years, I've heard about the wine glasses that have flown off the shelves and I've never been able to get one, but this year I managed to snag one! Woo! What was less fun was waiting in the enormous line to pay for my treasures. Once we finally got through that line, we headed over to the main expo, which includes a larger official merchandise area and the rest of the vendors. This was a complete mad house. Thankfully, there wasn't much I wanted, so we just walked up and down the aisles checking out the insanity. I will give it to Disney, they are really trying to make this a fun experience including princess cocktails and stations to get your nails done. I did scoop up a pair of Ariel Havaianas, but saved a lot of time not waiting for the New Balance Shoes. In case you missed it, this year they themed the shoes around rides (instead of characters), which I didn't feel like I needed. We headed back to the hotel for some time off our feet before the 5k the next day! 1. Take care of your "must haves" first so that you don't have to worry about it (I stress about logistics) - meaning your bib. 2. The Disney Parks Blog shows the race merchandise a few days prior to the expo - go in having a view of what you might want. 3. RunDisney now relies solely on electronic race guides, which means you can check out the vendors ahead of time - know what really matters and what doesn't. 4. If you want New Balance shoes, check out their site for details on how to most efficiently get them - typically they will do a virtual queue that you can sign up for in advance. 5. Remember this is supposed to be fun! If you really want something, get it. This is a celebration of you and your training; the race(s) is the victory lap. Enjoy it, take a deep breath, and you'll survive! What are your tips for runDisney expos? What is the best thing you've ever purchased?